She opened her mouth. He watched in horror as two teeth began to elongate into sharp, curved fangs. He began to scream as she lowered her mouth to his neck, struggling in vain to free himself. Her fangs sank into his flesh like hot knives, ripping and tearing as she jerked her head. The blood began to flow, followed by the echo of his screams. If you didn’t know better you might think all vampires know how to do is brood and fall in love. I was more interested in writing about one that did neither. Jessie – short for Jessamine, a type of night-blooming flower – works as something of an enforcer for the vampire leader to whom she is fiercely loyal. She doesn’t believe in killing innocents but she has no trouble turning murderers and rapists into meals. It’s not her favorite thing to do, but she’ll also go after other supernatural creatures if they wreak too much havoc and attract too much attention from the mortal world. Writing a vampire that had a specific purpose, both in the story and their life in general, held a lot of appeal. Even more appealing was writing one that accepted their vampire nature. I suppose it’s possible that Jessie once spent a lot of brooding nights and sleepless days pondering her existence, but I had no real interest in exploring that. I didn’t want to write an origin story, I wanted to take a look at a vampire who is past all that angst and secure enough in their own monstrosity to not, well, get all emo about it. Jessie’s a full grown monster, completely at home in the night. 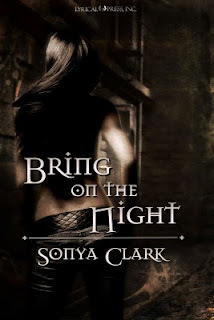 Bring on the Night is available for purchase at Lyrical Press and other vendors ebooks are sold. You can learn more about Sonya Clark at her blog. I bought my copy! Sitting pretty on my kindle. Nice post, Sonya.